All week long, right-wing spinhead Sean Hannity's been manically promoting his Sunday evening television show, Hannity's America, with promises of "exclusive footage of Al Gore getting of his private jet." This is presumably to prove that Gore's a hypocrite; how could the global-warming guru truly be so concerned with the environment if he squanders so much of our precious energy resources while also polluting the air, right? For narrow-minded conservative hacks like Hannity to suggest that powerful and influential world figures like Gore should travel commercially shows either extreme naivete or pathetic partisan bashing. I feel embarrassed for him. Gore's mission is to educate billions around the globe about climate control and help bring about change. If using extra fuel on a private jet is the price we have to pay for Gore's efforts and what they've yielded in terms of showcasing this very important issue on the world stage, then that's a cost-benefit analysis with a very positive conclusion. I'm certainly not changing my lifestyle while the Global Warming Hypocrite Alarmists preach the importance of change as they fly in their private planes. Al gore owns three houses and uses more utilities each month than 20 average Americans use. He's not even in these houses because he's flying around in personal jets. His pool house averages $500 per month utility bills. Then we have Hollywood idiots telling us to use a single sheet of toilet paper to save the world. Yeah right. I'll go out on a limb and say that I'm willing to bet that I conserve more energy as a conservative living a normal lifestyle and recycling than most liberal Global Warming Alarmists out there. Al Gore can keep polluting rivers with his Zinc mining cronies and liberals will praise him. Al Gore claims to purchase carbon credits for his hypocricy, but its a lie. He does not pay for these credits, his company provides these 'carbon credit' purchases as a employee benefit. 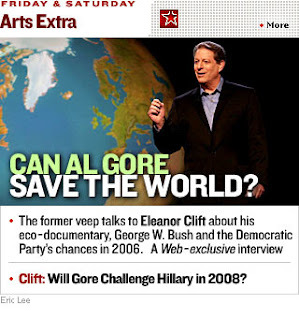 This further shows that Al Gore can't make a sacrifice that he will feel for the sake of saving the Earth. Al Gore is a Global Warming Alarmist Hypocrite. BTW, the hottest year in the last century was in the 1930's, not the 1990's. However, just to be fair and HONEST, unlike the "anonymous said", because we know they don't accept responsibility for anything, including their non stop lies. Mr. Gore actually does take commercial flights most of the time. As he even repeated and made clear when Larry King had him on and repeated a comment from a viewer. Mr. Gore said rarely does he take private jets, most of the time he flies commercially. But because he is leading! Another example of wierdness is the fact that you post a link to a blog post from a random website, and believe that post 'speaks' for the intelligence level of a political base. That would be like concluding the Democrat base is stupid just because you are part of it. Great Post Andy. I would vote for Al Gore in a second (for the second time). Great post on the stupidity of Hannity and his ilk. But it is worth pondering why the right-wing is so obsessed with finding faults in Gore. Fear of him running and taking the 2008 election in a landslide is no doubt part of it. Let's hope we hear some positive news from Gore soon. It's because Gore's hypocricy is so obvious that something must be said. If he told me to change my lifestyle while he actually changed his lifestyle I would respect him. Anytime a public figure takes a position and doesn't follow it to the letter, he or she is accused of hypocrisy and held up to ridicule. What the accusers like those hounding VP Gore fail to realize is that even if Mr. Gore were to do everything within his power to cut his energy consumption, it STILL wouldn't make any difference in the long run, especially compared to the waste so prevalent in our society. As you so succinctly put it, Andy, "Gore's mission is to educate billions around the globe about climate control and help bring about change." Whether Mr. Gore does that by flying on a private jet at times is simply a red herring his detractors love to wave as a sign of their hatred for him. Al Gore, the individual, most likely has one of the world's largest carbon footprints. BTW, the activity that causes the most greenhouse gases surrounds the meat eating industry. If liberals really care about saving the Earth, they will stop eating meat. A quick check of Al Gore's waistline will show that he is not saving the Earth in this category either.